An introduction to the BeProud Foundation by Gurbaksh Chahal for the upcoming television and social media campaign. End Hate. Join the Movement. Visit http://www.beproud.org for more information. Deepak Chopra endorses BeProud Foundation's movement to help end hate. Visit http://www.beproud.org for more information. Superstar Jay Sean endorses BeProud Foundation's movement to help end hate. Visit http://www.beproud.org for more information. 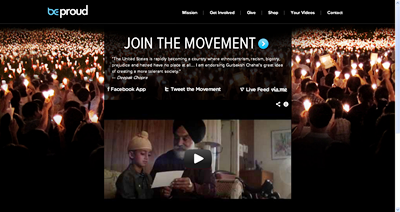 Kabir Bedi endorses BeProud Foundation's movement to help end hate. Visit http://www.beproud.org for more information. The Nelson Mandela Family's Ndaba Mandela endorses BeProud Foundation's movement to help end hate. Visit http://www.beproud.org for more information. Gurinder Chadha endorses BeProud Foundation's movement to help end hate. Visit http://www.beproud.org for more information. 1. Use your mobile camera, video camera, or webcam. 2. Record a short video (up to 60 seconds long) that answers the question, What are you most proud of? 3. Go to YouTube and upload your video. (See how to do that here.) Simply put keywords "BeProud" and "#EndHate" when you upload. This simple act will help spread the message that we should all be proud of what makes us unique. Make your voice heard today!